Earlier this week I attended an open house at T’s school and, as is my nature, I followed the scent of books and drifted away from the excited chatter of children towards the library of children’s tomes. I was impressed with the large collection. Some of the teachers directed me to one book in particular, The Invention of Hugo Cabret. This book, by Brian Selznick, and published this year, is a blend of picture book, novel, film history, and magic. The story centers around a young boy named Hugo Cabret who lives in the walls of a Paris train station. He was orphaned when his father, a clockmaker, met a tragic death. Soon after, he was taken in by his uncle and served as his apprentice, winding and calibrating the clocks around the station. One day his uncle never came back from his nights out drinking and poor Hugo carried on the duties of clockmaster. I won’t give away any more, other than that the other characters include a menacing stationmaster, an enigmatic toymaker, a mischievous girl who borrows books from the local bookstore, and a one-eyed projectionist. The story charmingly weaves the early history of cinema and its connection to magicians and automata (strange complex machines made to do unmachine things). Though the book is over 500 pages long, half of it is illustrations that narrate the action as if it were a silent film. And while it’s marketed as a children’s book, I think any adult can appreciate the detail and imagination that went into making this thoroughly satisfying read. The sketch in this post is not in the book but was drawn by the author intended for the book. You can see the kind of painstaking detail that went into creating the story. 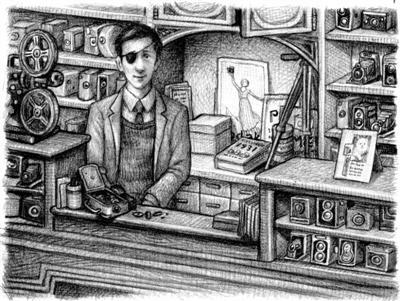 He spent a great deal of time, for example, in an antique camera shop to be able to sketch the cameras accurately. While reading I noticed similarities to themes from Hayao Miyazaki’s movies such as courageous orphans, a sassy girl, mechanical things, an old man who tinkers with machines, a wise compassionate old lady, children finding purpose, and the attention to architectural details. I think The Invention of Hugo Cabret is a natural book to make into a Miyazaki movie. You heard it here first. This book is ideal for film buffs, budding magicians, people fascinated with clocks and mechanical things, and it can be read by children 10 years old and up. i’ll check out ‘a dangerous book for boys’. it’s gotten a lot of buzz lately so i’ll review it when i get the chance.